Children at St. Joseph’s raise £434.89 for CAFOD. The fundraising project was part of a school initiative in helping others, and work included finding out about Fair Trade. Each class decided how they should raise their money for the project. Simon and children from St. Joseph’s with a £434.89 Cheque for CAFOD. For example, Class 5 baked their own bread and sold it to their school friends. Class 4 held their own school fair, and manned stalls which included face and nail painting, find the treasure and beat the goalie. 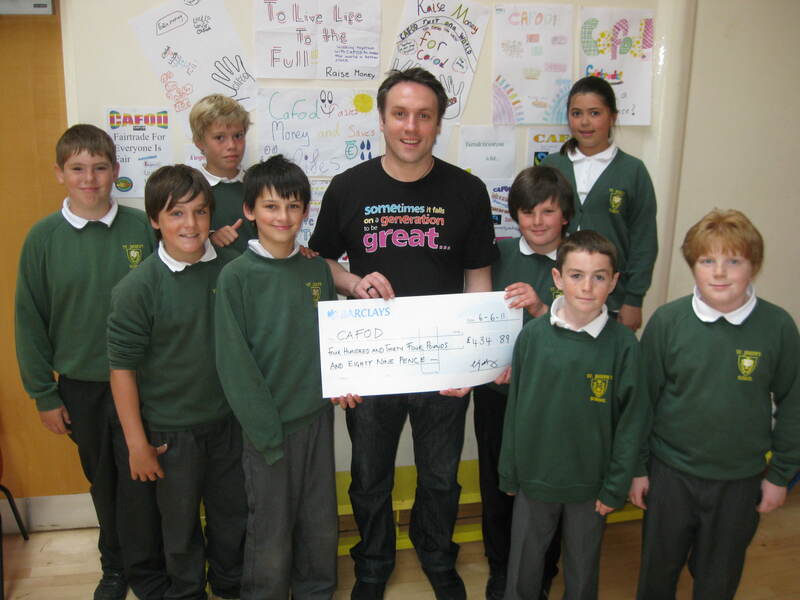 On Monday 6th June, Simon visited St Joseph’s Catholic Primary School in Exmouth and received a cheque for £434.89. During the day, Simon worked with each class explaining the valuable work CAFOD carries out in developing countries. This includes the contribution Fairtrade makes to communities around the world which CAFOD has been instrumental in developing. This entry was posted in Education, Fundraising and tagged advocacy, aid, aid work, CAFOD, CAFOD PLYMOUTH, Campaign, Colombia, Drought, earthquake, emergencies, Facebook, Fair, fairtrade, fast day, food, fund raising, Fundraising, Haiti, Make your money count, Rwanda, Sri Lanka, St. Joseph’s, Successes, Sudan, trade, typhoon by CAFOD Plymouth. Bookmark the permalink.